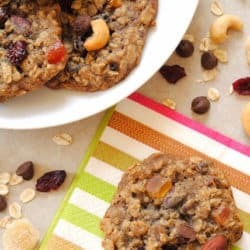 13 freezer meal ideas that are perfect for new parents, somebody grieving a loss or recovering from illness or injury, or anybody who just wants to have a few meals tucked away for a busy weeknight! Delicious, mostly non-casserole, home chef freezer meal ideas made with fresh ingredients. Hi friends! I wanted to pop in and say a quick hello and share some freezer meal ideas. While I’m still mostly on maternity leave after the birth of my daughter, I’m easing back into freelance photo shoots part time. Basically, working during nap time until Vida heads to daycare, when I’ll return to running my blog and freelance businesses full time. The topic of FREEZER MEALS garnered a lot of interest when I mentioned it on Instagram. Honestly, freezer meals saved our sanity in those early weeks caring for a newborn and recovering from birth complications. In the months leading up to my due date, Jeff and I worked diligently most weekends to prepare about a month’s worth of freezer meals (and sprang for a chest freezer for the basement to store them all in!). My parents also pitched in and made us quite a few meals. 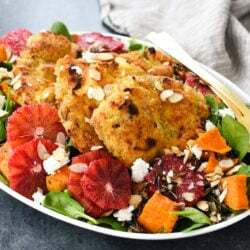 The goals for these freezer meal ideas were simple: delicious meals that would comfort us during a cold time of year in the Midwest, but trying to stay away from too many casseroles and packaged ingredients. Today, I’m going to do a quick roundup of what we made, what we served it with, and some general tips for freezer meals. I’d love it if you shared this freezer meal ideas guide with anybody preparing meals for new parents, somebody grieving a loss or recovering from illness or injury, or anybody who just wants to have a few meals tucked away for a busy weeknight! While I don’t have photos of everything we made, I’ll include images where I can. Savory Waffles. Jeff made these and froze them in Ziploc bags. Instead of using ham and Swiss cheese, he made them with bacon and Cheddar cheese. 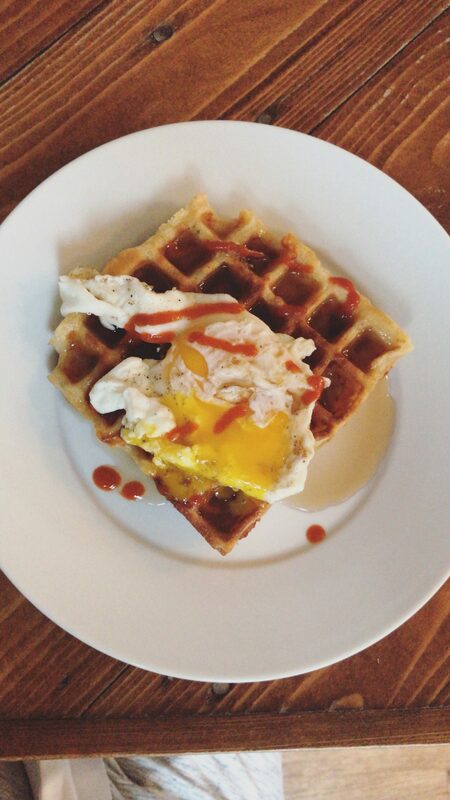 Served with: maple syrup, sriracha and an egg on top (we skipped the mustard sour cream). Sweet and savory forever! Breakfast Casserole (loosely based on this recipe). Jeff also made this, and added extra veggies. He baked it and cooled it. Then he cut it into pieces, individually wrapped the pieces and froze them. Served with: English muffins some days where we were extra hungry, nothing other days (a piece of this is a pretty complete meal on it’s own). 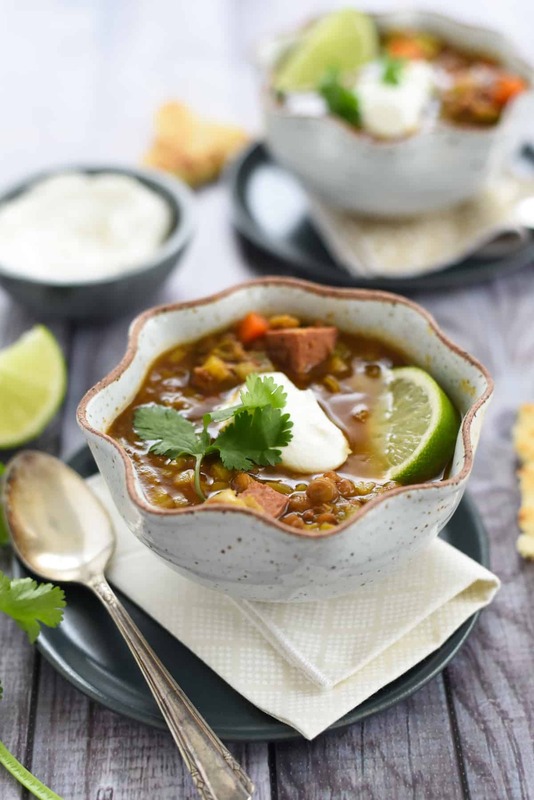 Slow Cooker Lentil & Sausage Soup. My mom made this and froze it in a Ziploc bag. We reheated it on the stove. Served with: cheese and crackers. Loaded Baked Potato-Style Cauliflower Soup. We happened to have a few portions of this left over from when we originally made it last summer (yes we’re weird and eat soup in the summer). I’m happy to report that it froze and reheated quite well. Served with: extra cheese and bacon on top! 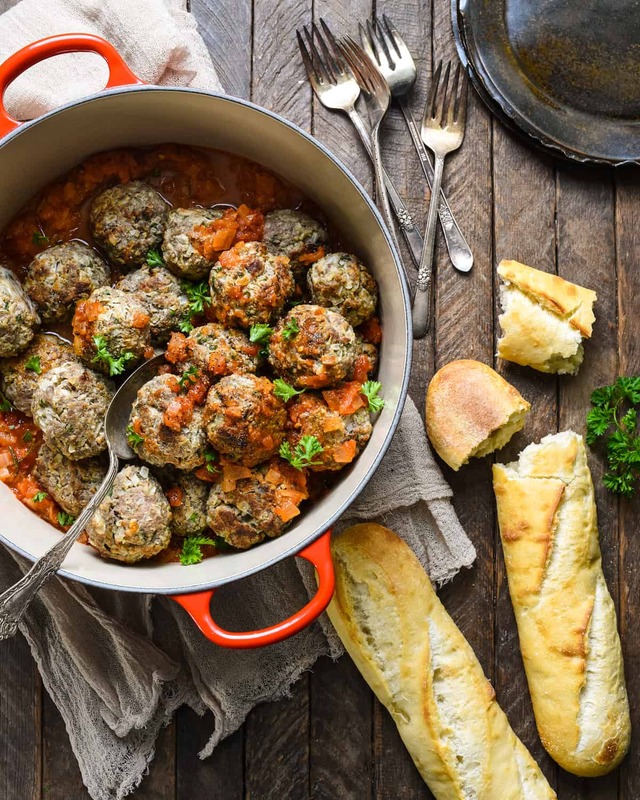 Lamb Meatballs with Spiced Tomato Sauce. One of our favorite meals! We made them exactly as written through Step 5, then portioned them into small freezer-safe foil pans and froze. We popped them in the oven to reheat. Served with: boxed couscous and frozen veggies (we like those boxes of Green Giant Steamers because they are perfectly portioned for two servings). Slow Cooker Tandoori Chicken. Basically all I did here was stir together some Greek yogurt and tandoori seasoning, then pour that over (raw) boneless, skinless chicken thighs. I froze the marinated chicken in Ziploc bags. Before serving, I would thaw the chicken in the fridge a day or two, then put it in a slow cooker on low for 8 hours. At the end, it shredded really nice. Served with: brown rice (frozen bag that you just microwave) and frozen veggies. Picadillo Sloppy Joes. Yum yum yum. This froze well and was easy to re-heat on the stove with a little bit of water or broth. Served with: brown rice (instead of on buns) and bagged kale salad. Lasagna with Cottage Cheese. My mom made us her famous lasagna! She cut it into pieces and then wrapped and froze them. 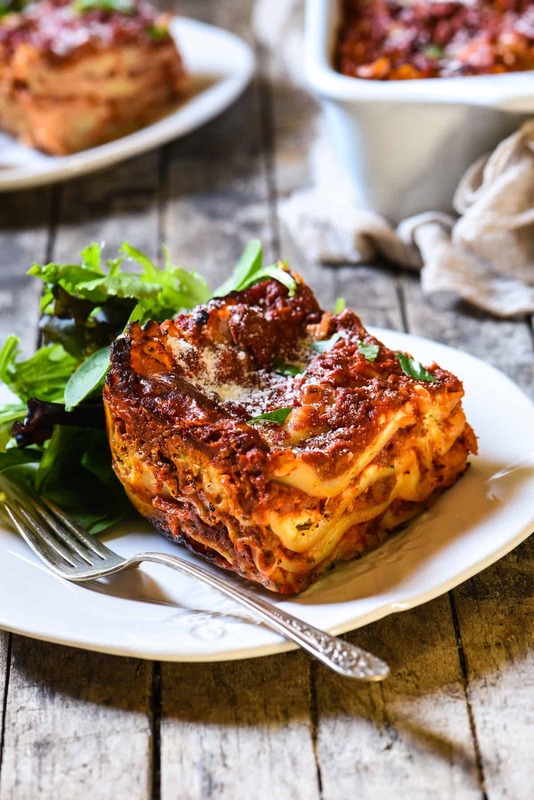 Pro tip: I’ve found the best way to reheat pieces of lasagna is to place a few tablespoons of water in the bottom of a baking dish, and then put the lasagna pieces down on top of the water (this prevents the bottom noodle layer from getting all crusty and hard). Bake at 350 degrees F until hot all the way through. Served with: garlic bread and frozen veggies. Homemade mac and cheese. Made through Step 3, then frozen. Is frozen and baked mac and cheese as good as making it fresh? No. But it’s still tasty; especially if you undercook the noodles a little bit when you first make it (that way they don’t get too mushy when you bake it from frozen). Served with: turkey kielbasa and bagged salad. Turkey Pot Pie (we had one of these for a quiet Thanksgiving dinner at home). I made a triple batch of the recipe (yes, 6 pies!) using leftover roasted turkey from my Maple Bourbon Glazed Turkey photo shoot. I followed the recipe pretty much as written through Step 2, except I used a top crust AND a bottom crust (I really like crust) and I didn’t cut slits or do the egg wash. I assembled the pies in disposable foil pie plates, then wrapped them and froze them. I was able to share the pot pie love with another family with a new baby, as well as my parents. I thawed each pie for 2 to 3 days before baking. Then, I cut the slits, did the egg wash, and baked until the center reached at least 165 degrees F (it takes awhile, but it’s worth it!). Served with: a glass of wine! 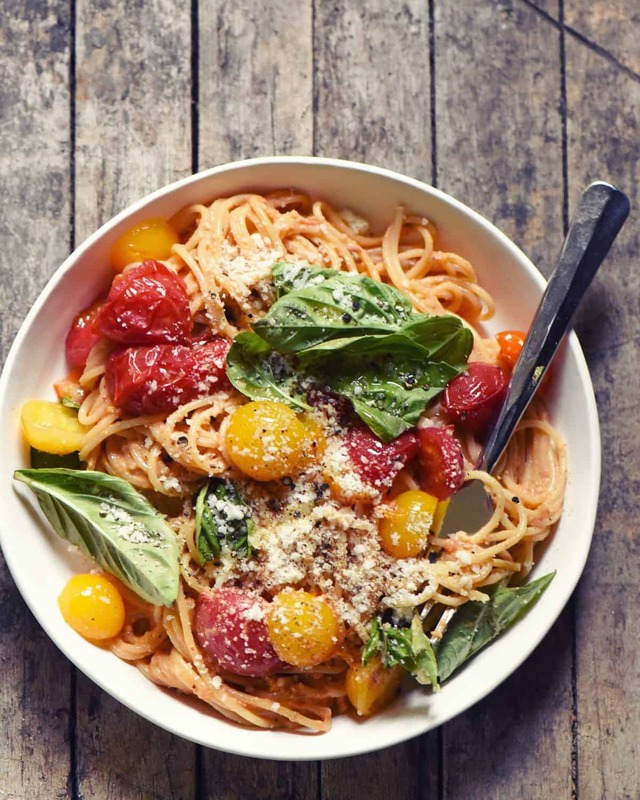 Spaghetti with Tomato & Walnut Pesto. Another one of our very favorite meals. I prepared the pesto and froze it in small containers. Then, when it was time to eat, I would gently re-heat the pesto on the stove while cooking spaghetti, then toss it all together. Sometimes I would top the pasta with extra roasted tomatoes and basil like the recipe calls for, sometimes not. Served with: salad or frozen veggies. Slow Cooker Veggie & Short Rib Soup. This is another one of my mom’s famous recipes. I’ll be sharing it soon. Please stay tuned for that. Chicken Enchiladas. My parents made these for us. Instead of dividing them into just two pans, they divided them into several pans, since just two of us would be eating them. These were so cheesy and good! Served with: Mexican rice, refried beans, and a little lettuce and tomato if we had it. If you’re cooking for new parents, be generous with the portions, especially in the early days. Mom may be extra hungry from nursing, and Dad is probably equally hungry! If they have leftovers, they can always eat them for lunch the next day. I’ve been using these freezer safe disposable foil pans for several years now. I love them because you can easily label them and write cooking instructions on top, they stack nicely, and they go directly from freezer to oven. Don’t forget dessert! After Halloween, we made a big batch of Leftover Halloween Candy Cookie Dough and froze it in pre-scooped portions. It was really awesome to be able to bake a few fresh cookies once the baby was down for the night. Chocolate chip cookie dough and monster cookie dough also freezes well! What are some of your favorite freezer meal ideas? I’d love to hear about YOUR freezer meal ideas in the comments! I have never done freezer meals, so it’s nice to have some ideas. 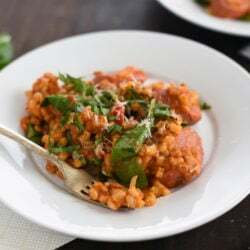 I especially like the idea of the lentil soup (I’ve picked up a couple of recipes for lentil soup lately, but I think this one will win out. Glad you liked this post, Susan! We eat a lot of lentil soup around here. Nutritious and delicious! Love this post! I’m expecting baby #3 and know that life will be insane so I look forward to freezing some of these meal ideas ahead of time.